Aussie filmmaker James Wan is best known for thrilling horror movie audiences with a string of hits, from Saw to The Conjuring. 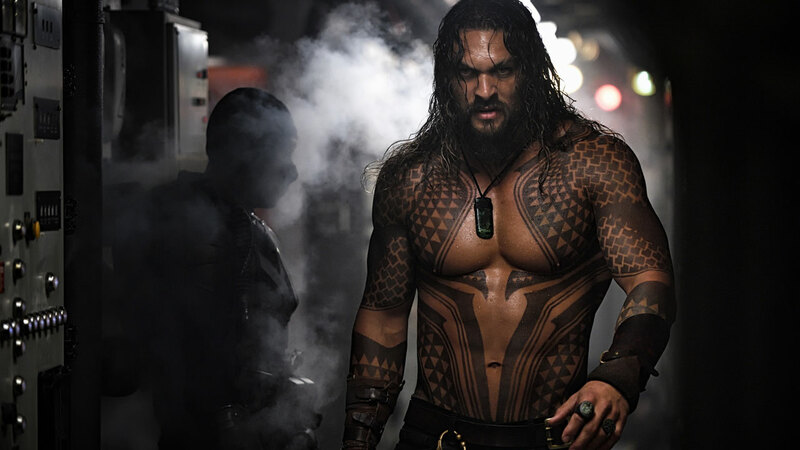 But with the December 21st release of Aquaman -- the first theatrical film devoted to the perennial fan-favorite DC Super Hero -- Wan is set to wow an entirely new audience of filmgoers around the world. 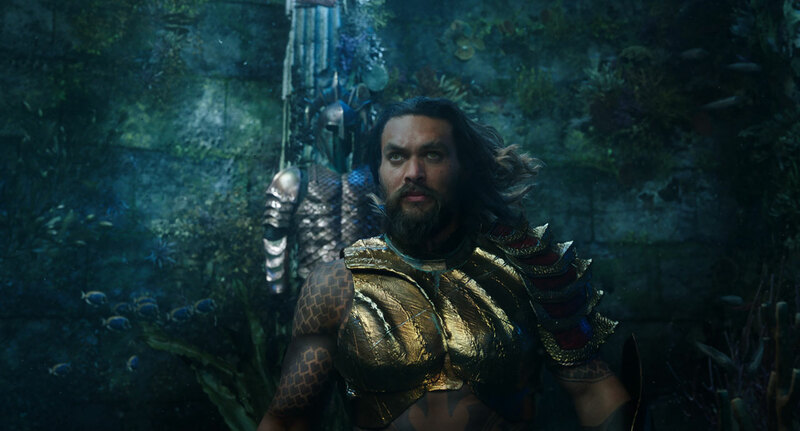 We recently caught up with Wan in his editing suite on the Warner Bros. Studios lot in Burbank, and he spoke with us about what went into making one of this year's most eagerly awaited big-screen epics. "Yeah, it’s really weird. Even though it’s a superhero character, my approach to it really wasn’t as a superhero film. I really wanted more [of a] fantasy approach to it. I’ve culled influences from stuff that inspired me and influenced me since I was a little kid, like all the way from classic Ray Harryhausen [films], to Spielberg's earlier stuff. There was a lot of that. I think I’ve mentioned a bit of my love for Romancing the Stone as well, just the way the characters interact... It’s a bit of a mixture, the film really has a lot of different flavors to it -- using the mythology of Aquaman, the world of Aquaman, to pull it all together. I was a big fan of what [artist] Ivan Reis did, and what [writer] Geoff Johns and Ivan did together. The story was definitely inspired by Geoff Johns’ run on New 52, but I actually kind of went back to a lot of the earlier stuff as well. The different characters, the different world. I love [artist] Nick Cardy’s stuff. I love the first series. The stuff that eventually sort of inspired Super Friends and the Aquaman TV series. I love that. So, I thought, "I’m not going to shy away from it. I’m going to embrace that and kind of do my own version of that." I just love that retro quality that the original comic book had, and all the really fun characters, and tried and find ways to fit them into this, basically. It’s a re-telling of a character that has somewhat become a joke over the years. So it’s like, "How do I make him cooler and more relevant for today’s world?" I definitely went back to even the earlier stuff for inspiration. 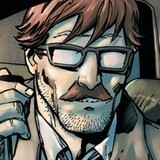 I felt like all the very overtly cool characters, in-your-face cool characters, have been done already. But because of that, I really enjoy and really took a liking to the underdog nature of his character. Not just his character, but the underdog quality of how we all perceive this guy. I think there was something kind of cool about that. To me, it’s more special to come in and do something unique with a character like that, than coming and doing a Batman, or something that you’ve seen many versions of already. So the fact that I can come in and do something unique, and no one’s really seen this sort of big-screen adaptation, is what really excited me. There's a love story between Arthur and Mera, but for me, the love story between mom and dad is just as important. Mom and dad’s love story is the emotional backbone for the lead character, and what drives him for the rest of the movie. So I think it’s an important thing. One of the things that I really want to capture with the civilization of Atlantis is, it’s a bit of new and old. We’re all familiar with the legend of Atlantis. That they were such an advanced race of people, and culturally far ahead, but they became too powerful for their own good, and they sank as a result of that. So I took a lot of that mythology and kind of played with it. So even though Atlantis is a civilization underwater, it’s been around for a long time, hundreds of years. So they’re very technologically advanced, and socially, they’re very advanced. But yet in other ways, they’re still very archaic. They still have a monarch system that they’re very true to. They have a very rigid way of looking at things -- playing out the whole monarch aspect, and amping that up to its tenth degree. They’re a race of underwater people, and they don’t usually come up here that much. It’s partly because they don’t like us. They have no desire to come up here. Literally, this movie cannot be more of a fish-out-of-water [story]. They’re not accustomed to surface world tradition. 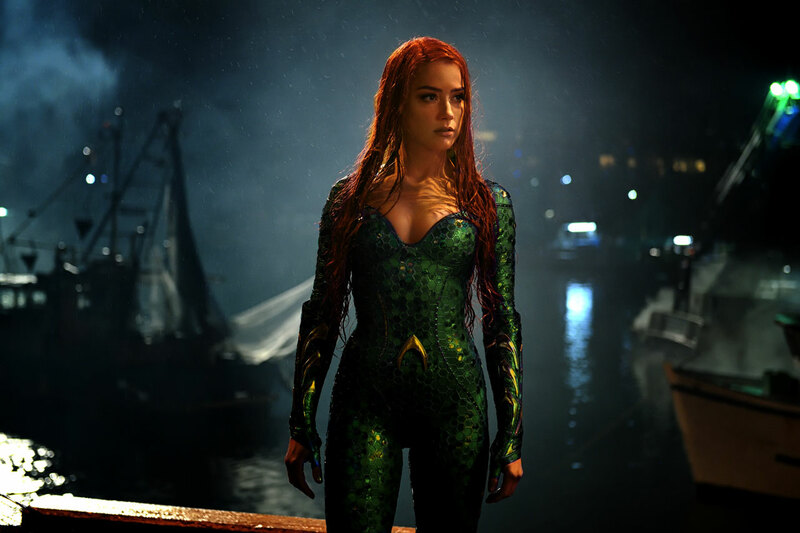 I tried to play into that a lot, especially between Arthur and Mera, between Jason [Momoa]’s character and Amber [Heard]’s character. Jason is the fish out of water when he’s in Atlantis, and she’s the fish out of water when she’s on the surface world. So they have to work together and get along. Things are weird over there, things are weird over here, and part of that is where the fun comes from. I try to touch on a little bit of that without going too heavy. It’s really that fine line. We spent months and months and months, and years, just developing the look, the visuals. Trying to find that right balance where it’s not so on-the-nose and "Hey, look at me, I’m a big, bright, poppy film!" but one that still stays true to the tone, of an action swashbuckling adventure -- [which] allows me to be a little bit more poppy and a bit more popcorn-y, but always go, "OK, I can also lean this way and get a bit more scary if I need to be." Because, again, the story and the world really lends itself to lots of different flavors. I always say that the ocean is a really magical place. It’s full of wonder and magic. But it also can be really scary as well. So this movie really lets me lean into both concepts. Then, from that, I try to pull inspirations for designs, visual cues for the world that [the characters] are supposed to be from. I get people asking me, "Do you shoot the underwater stuff underwater?" Or "Are you shooting in slow-motion to try and capture the slow-motion nature of underwater movement?" No, you’re thinking like a surface dweller. When you’re from that world, you don’t move like that. We do. But they’re actually way more powerful when they’re underwater. So, right from the onset, we all thought that the characters should move like they would move in a normal environment for them. They’re supercharged in a lot of ways. So there was a lot of planning from all of us -- from the conceptual team to working with the stunt people to designing rigs that the actors can sit in and move in. Then, I had to think, "Okay, so when we’re on land and we’re walking, we move our arms left and right to keep ourselves balanced. What is the version of that they do when they’re swimming?" The tiniest little movement would propel them so far forward, like sharks, like dolphins. With the tiniest little bit of muscle movement, they just rocket through the water. So even though it’s fantasy, I try to bring as much of reality into it as I can; but still have a bit of liberty with it as well. It took a long time. 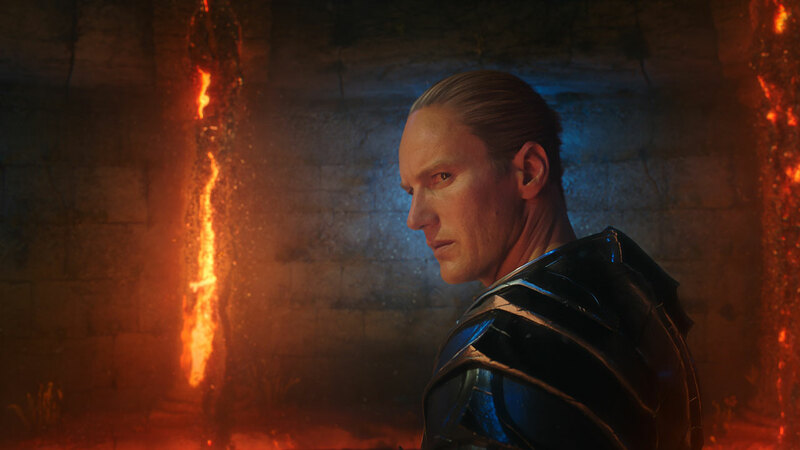 [The fight between Orm and Arthur], it’s a fight sequence that we’ve seen before, a classic sword fight. But you take it and you transport it to this environment, and it takes on a whole different look and feel -- visually and in how the characters move. So it informs the choreography and all that. We just started off with baby steps, designing the fight itself on flat ground. Then at some point we go, "You know what? Instead of ducking, maybe he spins in the air. That would take it to the next level." Then we bring wire into the equation. Then we redesign it based on some wire work, and then visual effects come in and help us take it to a whole different level that we couldn’t do otherwise. Obviously, VFX is doing all the environments anyway, but we start with practical, real stunts with stunt guys, laying out the flow and the action, and working with my editor to put it all together. Nothing in this movie is straightforward. Not even two people sitting around talking is straightforward. There are CG hair, costumes, beard and all that. It’s such a nightmare. It’s such a difficult movie to make from a technical standpoint. It’s great. My imagination is my limitation, basically. So I can run really wild with my designs and ideas and all that. I’ve been wanting to make a design movie for the longest time. I’ve never had the money to back me up. So that was part of the thing that I really enjoyed about this particular character -- not only do I get to revamp this underdog character, but also the opportunity to design different worlds visually, and create other kingdoms. I’m a big fan of world creation. I do a little bit of that in my horror films. They all take place in their own little world. So I wanted to apply that kind of thinking to this world. And Atlantis is just a slice of the different worlds that we’ll visit... The concept is, when ancient Atlantis sank, they grew, they built. But they grew new Atlantis on top of it. So structurally -- trying to think how construction underwater would look like -- there would be no steel or wood or metal. So thinking about how they built their buildings, the way I believe they would do it is like how corals are made. So buildings are grown like corals. That really informs what the visuals are. You hear a lot today about diversity in films, and casting a diverse cast, and stuff like that. I love the idea that in this world, I can actually go even further and actually show all the different ethnicities and races and different kingdoms. 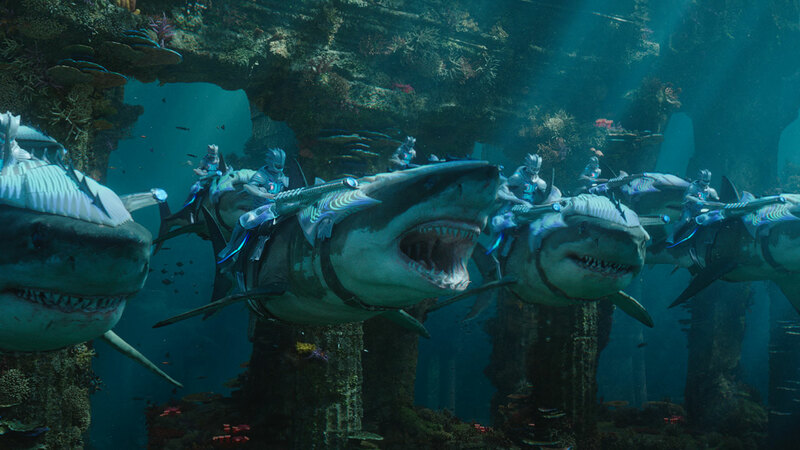 There’s seven kingdoms in the underwater world. In a handful of the kingdoms they look more like normal humans, like you and I. But then there are other kingdoms you’ve seen in the trailer. There’s one where they’re just merpeople. Then there’s another kingdom where they’re basically all giant crustaceans. They’re big crab men and women. Another kingdom is the Trench, these monsters. Obviously, a lot of this is heavily inspired by what Geoff Johns did in New 52... It’s really about Arthur going through a hero’s journey, seeing all the different cultures and appreciating all the different people that are there, that he never quite appreciated before. We start the movie with the way his character was left off in Justice League. Ultimately, he goes through a hero’s journey here to become someone very different to where the movie started. If he’s going to be, eventually, the king of these people, he needs to know his subjects, and he needs to really understand who all these different people are. It’s not like we’re going to visit this magical world that is in outer space, that is in another dimension. It’s taking place right here on Earth. The coolest thing is, we’ve explored so little of the ocean. We’ve explored space more than we have actually explored the ocean. So the idea that there could be a massive civilization of beings, and another race of people, is super exciting for me, and this movie really touches on that. One of the coolest things about meeting Jason was seeing how funny and cool he is, and how charming and likable he is in person. So I tried to get more of that person that he is in real life into the movie.